Imprint Method: Silkscreen - Shake things up for your customers and supporters with this handsome bit of barware. 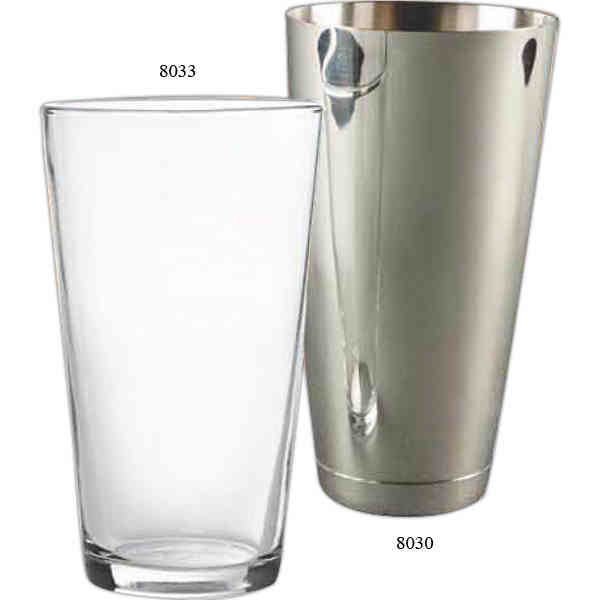 This combination shaker and mixing set features a 5 3/4" x 3 1/2" clear heavyweight 16 ounce glass and a stainless steel shell that provides a tight seal. Add your organizational or company design, logo or message through your choice of our signature imprint methods to create branded gear that's just as home in your home bar as it is in a professional taproom or restaurant. This set makes a great giveaway at grand openings, cocktail tastings, special promotions, and other private or company events. Price Includes:one color / one position imprint. Imprint Size:2 1/4" x 2 1/4"